The importance of properly functioning brakes should be obvious to anyone – they ensure your vehicle can slow and stop in an emergency. At Mr Tyre we take your safety seriously, which is why we provide brakes for a range of vehicles as well as free brake safety reports. 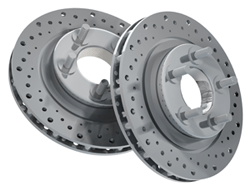 To ensure that your brakes are always working at their optimum, it is recommended that you have all aspects of your braking system routinely inspected – especially before undertaking a long journey. Providing you with honest, friendly advice, as well as competitively priced products, we’re happy to assess your brakes and make recommendations for fluid replacements, cable lubrication and fitted brakes. Contact our team today, whether you know you need replacement brakes or the ABS light on your dash is flashing. You can book an appointment at your local, independent garage at a time to suit you.